The model you have selected is equipped with special, manual, ambidextrous safety levers that also allow you to decock (uncock) a cocked pistol without manipulating the trigger. Conventional thumb decocking procedures are therefore not necessary and should not be employed with this pistol. The safety mechanism provides that the hammer cannot contact the firing pin unless the safety is disengaged. 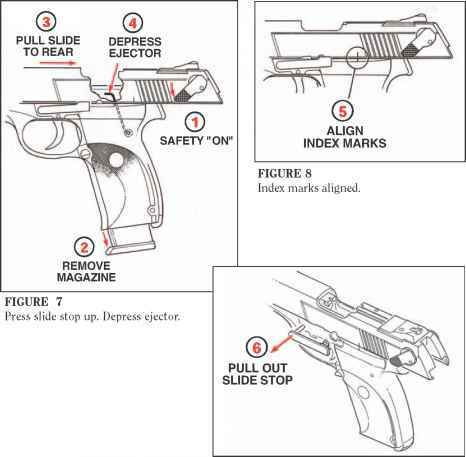 With the hammer cocked, actuating the safety mechanism automatically drops the hammer onto the slide without contacting the firing pin. Thus, the safety also serves as a decocking lever. Additionally, the pistol has a separate internal firing pin block which will not allow the firing pin to move forward and contact the cartridge until the operator pulls the trigger with the safety off (in its "fire" position). The pistol can and should be loaded and unloaded with the safety engaged in its "safe" position (lever fully down, white dot exposed). The safety should be in its "safe" position at all times except when the user is deliberately positioned to fire at a selected target. When the safety is in the "fire" position (safety lever up) the red dot is exposed through the hole in the left safety lever. See Figures 2 and 3, below, which illustrate the two positions of the safety.